Visitors to an Innsbruck gallery can crawl from room to room via a series of bouncy net tunnels installed by design collective Numen/For Use. The Tube installation takes over spaces inside the Austrian city's Aut Architektur und Tirol, located in the 1920s former Adambräu brewery building by Modernist architect Lois Welzenbacher. "Tube is a new installation concept constructed of stitched safety nets, which assume a form of a closed hose that pulsates and oscillates in the longitudinal section," said Numen/For Use. "The object is suspended from surrounding surfaces with numerous elastic strings, channelling a giant convulsing centipede." The studio, led by designers Sven Jonke, Christoph Katzler and Nikola Radeljković, is known for creating interactive installations that visitors can climb up, clamber through or hide inside. 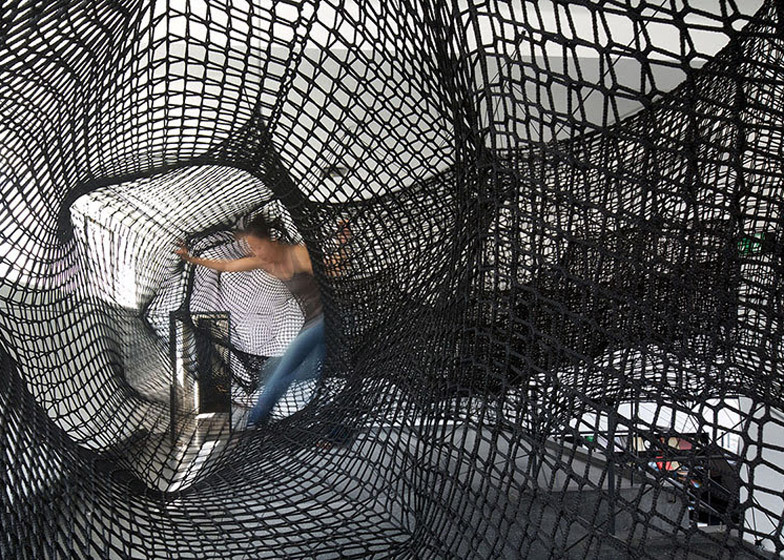 Materials used to create these structures include sticky tape, ropes and carpet. The studio has employed netting on several previous occasions, like for a black staircase at a museum in Linz and a stretchy web inside a Belgian gallery. For this latest installation, the team used elastic strings to hang the tubes of black nets inside the building's large rooms. The net tunnels create a route between different spaces, rising up through holes in the floors and circling around structural columns – though some of the tubes lead to dead ends. The elasticated supporting strings cause the tubes to bounce when someone crawls through. The open weave of the netting lets users spot others in different sections, as well as the space around them. "Such dispersed structural support enables even distribution of forces and allows the structure to feel soft and fully transparent as it transcends the architectural void, causing the sensation of free floating for the person inside," Numen/For Use said. Tube will remain in place until 10 October 2015. As the strings can stretch to fix to any surface, the installation could be moved to another location with different spatial parameters. "Tube's irregular geometry defined by varying disposition of support strings makes it a perfect parasite – universally adaptable to new contexts and spaces," said Numen/For Use. Photography is by Günter Richard Wett and Numen/For Use.